Members of the community group, A Voice for Leith Hill, had identified twenty iconic trees in the historic sunken lane which are threatened by oil drilling plans for Leith Hill and campaigned to have them protected. Tree Preservation Orders are designed to protect amenity trees which are at risk. The maximum sentence for breaching a TPO is a fine of £20,000 in a Magistrates’ Court or an unlimited fine in the Crown Court. Councillors at the meeting said the trees were part of what makes the Mole Valley countryside so beautiful and that it was important to look after them. 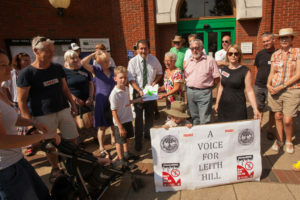 “We’re delighted that the Council has made this order, after a long campaign and raising over 2000 signatures on a petition”, said Sarajane Ferris, of A Voice for Leith Hill. Europa Oil and Gas is aiming to secure permission for all the conditions needed to start drilling at the site on Leith Hill. Its Traffic Management Plan, which proposes moving an oil rig up the narrow lane, as well as taking out tonnes of waste materials, is with Surrey County Council for consideration. The Tree Preservation Order was agreed by Mole Valley District Council’s Development Control Committee on 6 September 2017.